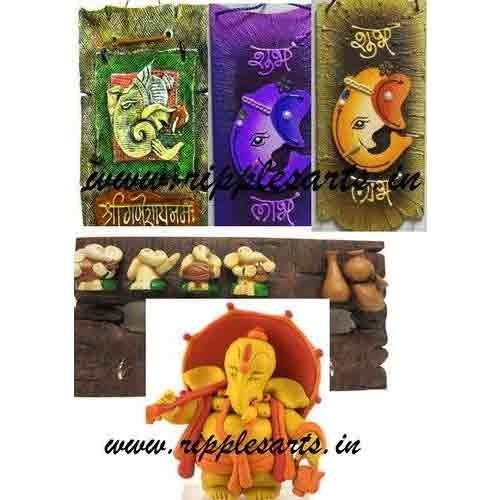 Under the wide array of gift solutions, Ganesha Gifts have been offered to our customers. These gift items are our exquisite offerings for auspicious occasions, specifically for Diwali. Our customers can source these items to cater to the diversified needs of corporate gifts and also personal one. These items are handmade and easy to care. Customers can ask for their requirements and also as per their specified budget. We, "Ripples Arts & Crafts", were established in the year 2011 as a prominent manufacturer, supplier, exporter, trader and service provider of a diverse array of Decorative Paintings & Handicrafts. In order to offer our customers, exquisite collection of decorative items, we have assorted Decorative Handicrafts, Handcrafted Jharokha and Decorative Paintings under the gamut of our products. We are providing service of Art and Craft and Handicraft. These art pieces are crafted and created by our in-house artists who have excellence in the specified stream. Our offered collection has gained appreciation across the nation and overseas, enabling us to become a favorite name for art lovers. We also provide Art & Craft Training Classes to the interest seekers, in order to teach them the basics of the specified field. Further, we are also offering designing & installation services. In the process, we are backed by our world-class workplace, where we bring forth our offerings. Our decorative items including paintings and handicrafts are drawn with utmost precision. Our artists execute their innovative ideas and offer our customers, art pieces characterized by impeccable color combinations & designs. Our firm was initiated focusing on satisfying the customers who want to have specific interiors in their homes or offices and throughout our journey, this client-centric approach has been carried forwarded. We are exporting in US, UK, Australia and Dubai.